#CCK11: Man! 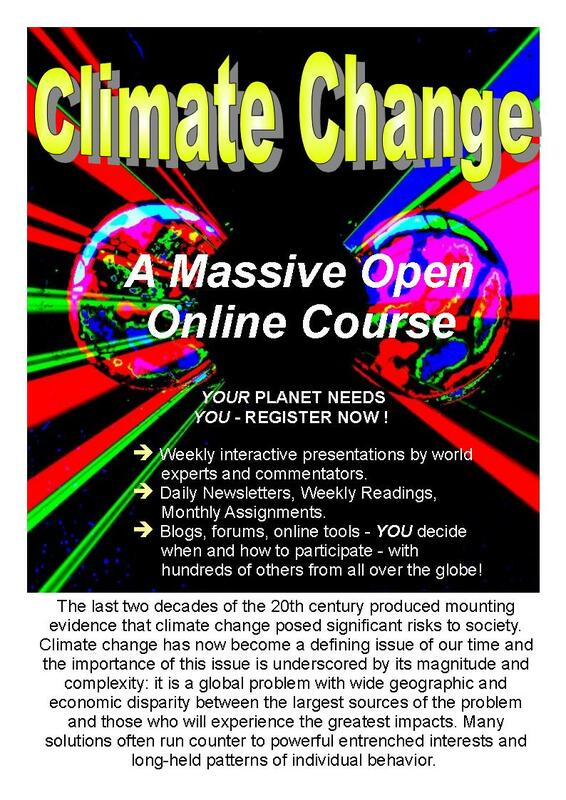 This MOOC is Something Else! Me: Hey! You! Get off of my Blog !! SixChick: Don’t hang around ’cause two’s a crowd – eh? Me: Look SixChick I don’t have time for this – I need to do a serious blog for the MOOC. Just go away! SC: Cool it Gordo! 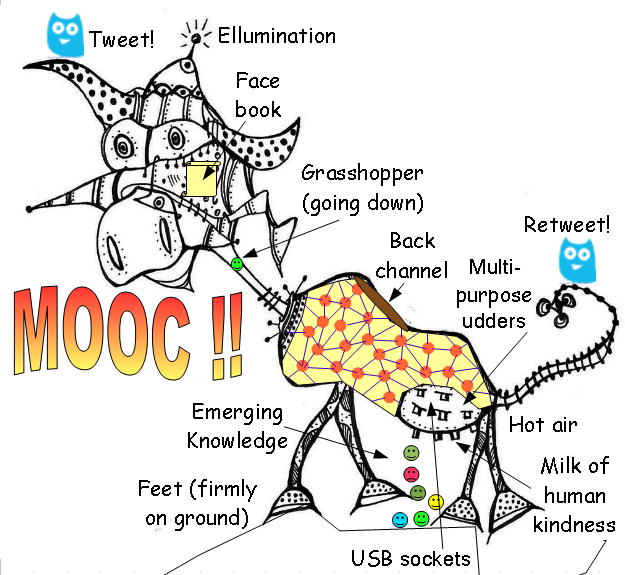 I’ll help you – I’m on this MOOC too y’know, as a serious Lurker! ME: Oh really? And don’t call me Gordo! SC: Yeah I dig it – it’s learned me lots – downloaded plenty stuff for free too. Like, man, there’s so much I’m not goin’ to get through it all before next Christmas! ME: You don’t understand – the knowledge is in the connections and it… well, sort of grows there and then emerges. SC: Awesome possum man! … Gee – I’d like to see that! ME: I don’t think you can actually see it – look, it’s something I’ve come on this MOOC to find out about. SC: Sure – but I haven’t seen the teachers! ME: There aren’t any – just a couple of facilitators who pop in and out from time to time. SC: Oh yeah! I heard a couple of them spouting in the Elluminate room thingy – groovy man! ME: These sessions can be very informative but I find the text chat distracting so I usually ignore it and concentrate on the speakers – it’s only good manners! SC: Are you for real? That’s the best part of it – I usually turn the sound off! ME: I was distracted once by a teleological argument in text about trees, deers, angels and tomatoes (?) – too deep for me! And because of that I missed a lengthy philosophical diatribe by one of the facilitators …. SC: What a blow! Be there or be square man! ME: But really, you can do anything you like on a MOOC – no learning objectives! SC: Doesn’t sound like much of a course then – I’d ask for my money back if it wasn’t free! Spicy meatballs! They just dump all their stuff on you for nothing – I just say they’re after your bread. I’ve seen how young naive teachers just outa college can take the bait with the first ‘ism doin’ the rounds – they’ll be selling them badges, T-shirts … time-shares maybe! Never trust anyone over 30 is what I always say! ME: Yup – ad nuseam for more than 30 years! Look SixChick – I’d be off like a shot if they tried to sell me as much as a pencil sharpener. I’ve given more courses in my time than you’ve had hot dinners and I’m pretty sure these guys are on the level. They work hard to set these MOOCs up, keep them going and they believe in what they’re doing even if you don’t. They say when they don’t know and they can even disagree with each other. SC: So they DON’T KNOW – AND they DISAGREE!! Hot diggity! Sounds like they haven’t prepared their stuff when they don’t know what they’re teachin’ – even more if they can’t agree what it is! Sometimes I wonder about you Gordo! ME: You don’t get it do you? We’re all in it together – scores of us from different countries, backgrounds, ages and experience in all types of education. There’s little hope of teaching so many people anything very specific, let alone indoctrinating them. It’s more of an open friendly forum – up to anyone, including the facilitators to read, study, interact and collaborate with others in any way they find useful. You call me Gordo again and I’ll throw you off this blog!! SC: And then, what about the candyasses repeating the course? SC: There’s people here must have failed the course at least twice before – all show and no go – they’ll fail again come the exams man! ME: SixChick, there’s no exams, no failures and a MOOC never really finishes. These people just come back to join in again – and maybe help the newbies! SC: But I’m a born rebel and I don’t agree with a lot of the stuff taught here! ME: Nobody says you should and there’s nothing wrong with being a rebel. Many advances are down to the rebels of the past but it’s not so easy to sort out the rebels that will make it, from the cranks, quacks and scammers in the present – just look at the flame wars going on in these newsgroups you spend so much time in! SC: Hey man, you know I’ve a PhD so I don’t have much trouble – I tell ’em as it is! And I’ve gotten a new learning theory of my own – you know this Pavlov dog thing? – well …..
ME: Don’t tell me! Just stop lurking and share it in the MOOC. You might get some help if you don’t put people’s backs up by being such a know-all. And then, OK, go off by yourself if you want, THINK, and then write it all up Einstein! SC: So I put it out on my blog and nobody comments. ME: You never know – but if you’re really serious submit it for peer review and publication. Review the literature so people see where you’re coming from and don’t forget to reference your sources. SC: Ah! – I’ve been warned about that game! Peer review by academics who can’t see the wood for the trees – no way Hosay! ME: No harm in trying – but OK, one way or another you need to open up to people who know a thing or two about what’s gone before and are well-placed to see how original your theory is – er … if it is. SC: Hmm .. I still don’t think this MOOC is a proper course. ME: I agree with you SixChick – it’s something else. ME: I don’t think it should be called a course and I’ve already said so here – though nobody paid much attention! SC: I’m not surprised man! So “The virtual proximity of a critical mass of connected learners over the same period of time seems a good starting point.” does it? Lah-di-dah to you too! ME: All I mean is that you could take that as a basic definition for any Online Learning Event (OLE) – so then anybody can come along and bolt on whatever they like to suit themselves – you could organize an OLE on Elvis with Hell’s Angel’s facilitators running along MOOC-like lines if you wanted to! SC: You ring my chimes man! I’d learn ’em somethin’ alright – ‘SixChick – The Sage on the Stage – with ELVIS!’. ME: Um – don’t throw the baby out with the bath water! SC: Tight, Gordo but ……..
ME: .. in a while crocodile!! Heh! Sorry about the intrusion everybody – pity, no time now to write the serious blog I’d planned on: ‘Connectivism, is it a Learning Theory?’ Oh well!